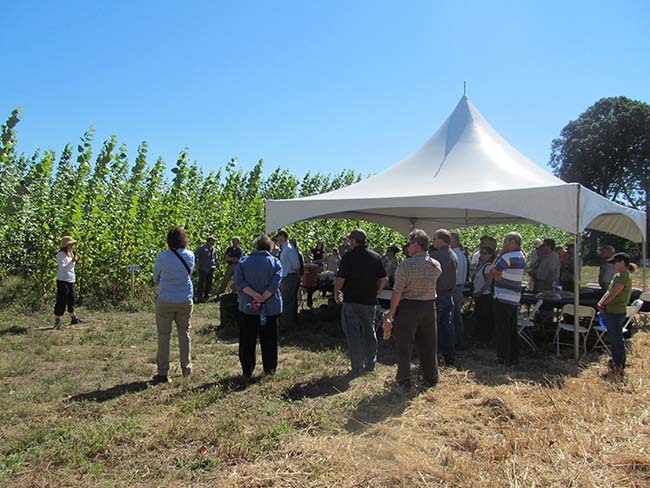 Over 120 interested public agency, policy, research, and extension stakeholders got an inside look at how poplars are grown for the production of biofuel at three demonstrations sites tours in Washington, Oregon, and Idaho this summer. The sites, part of the AHB research project, are designed to test and showcase all aspects of growing hybrid poplar as a renewable resource for home-grown transportation fuels in the Northwest. 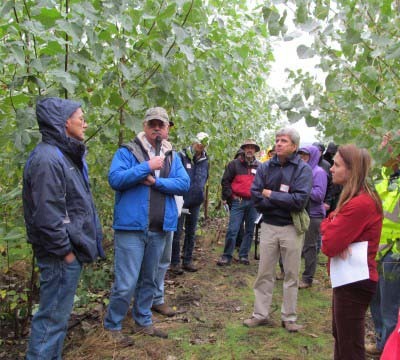 Visitors tour the Jefferson, OR demonstration site to see hybrid poplar grown for bioenergy. Photo by Shiba Kar, WSU. Attendees at each site learned that poplars lend themselves to the production of biofuel because they grow fast, have a high sugar content, and leave a smaller carbon footprint than corn ethanol or fossil fuels. The feedstock can be harvested as needed and is “stored on the stump” until a nearby biorefinery is ready to convert the woody biomass into fuel. “Everybody is intrigued by the idea. People I’ve talked to love that you can grow a tree that will add 10 to 12 feet in a year and has the potential to contribute to energy self-sufficiency,” said Chris Schnepf, an attendee from University of Idaho Extension. “What gives me the most hope is if there is a technology to generate liquid fuel that is affordable to produce and the cost of growing and transportation will be covered by the price,” he said. Research partners from GreenWood Resources, Inc., an Oregon-based company that developed and manages the demonstration sites, explained the renewable production cycle. Using a system of coppicing – cutting the trees at the base and allowing them to re-sprout – and a two- to three-year harvest cycle means the trees won’t need to be replanted for up to 23 years. Visitors were impressed to see that after two growing seasons, trees at the Jefferson, Oregon site were already 15-20 feet tall. The trees would be harvested using a forage harvester that cuts and chips in a single pass making the chips ready for a biorefinery. Research at the sites is designed to understand the growth and efficiency of different poplar clones under various conditions in the Northwest. Data collected from the demonstration sites will allow researchers to determine how much biomass volume per acre can be generated and help estimate production costs per green ton or per acre. Other types of data collection at the demonstration sites include soil quality parameters, wildlife monitoring, and pest and disease monitoring. Endophyte trials – inoculating trees with beneficial bacteria or fungi that can help deliver nutrients, stimulate root growth, and increase drought tolerance – are also underway. Walking the fields, participants were introduced to multiple varieties of hybrid poplar and viewed research trials on interplanting poplar with alder, an alternative hardwood feedstock, designed to determine the effects of nitrogen fixing on poplars. The rain stopped in time for visitors to see the poplar trees at the Hayden, ID tour. Photo by Shiba Kar WSU. The first tour in the series took place on August 19 with over 30 people visiting the 95-acre Pilchuck demonstration site near Stanwood, Washington. On September 9, over 50 visitors turned out to see the 85-acre site in Jefferson, Oregon. Despite pouring rain, over 40 people attended the tour in 65-acre Hayden site in Idaho on September 24. The rain stopped at a perfect time to allow visitors to tour the poplars. On November 4, a fourth tour will be held at the Clarksburg, California 50-acre demonstration site. The local landowner, government agencies, city officials, and legislators will be in attendance as well as project members from Washington State University Extension, GreenWood Resources, Inc., and University of California, Davis.